For the base: Mix the amaretto (or apple and cherry juice), lime juice and sugar (omit if using fruit juice) in a bowl and stir until the sugar has dissolved. Place the sponge fingers in a shallow dish and cover with the liquid. Leave for approximately 5 minutes or until all the liquid has been absorbed. Using a spoon, break the sponge fingers into small pieces and press them into the bottom of a large glass bowl or 8 individual glasses. For the jelly: Drain the liquid from the cherries and pour it into a saucepan. Roughly chop the cherries and add them to the liquid. Place the saucepan over a medium-high heat, bring to the boil and allow the liquid to bubble until it has reduced by half (approximately 5 minutes). When reduced, remove the pan from the heat and add the balsamic vinegar and softened gelatine to the warm liquid. Stir until the gelatine has completely melted and allow to cool. Pour the cherries and liquid into the bowl (or glasses) on top of the sponge fingers and place the bowl (or glasses) in the fridge for 45 minutes, or until the jelly has set. For the chocolate custard: Melt 150g of the chocolate in a bowl over a pan of simmering water. Once melted, remove the bowl from the heat and allow to cool before adding the custard and mixing until thoroughly combined. For the cream: Place the whipping cream in a bowl and whisk to firm peaks. Stir 2 tablespoons of the cream into the custard then fold the lime zest and icing sugar into the remaining cream. 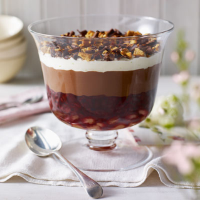 To serve: Once the jelly has set, spoon the chocolate custard on top and place the dessert in the fridge. Just before serving, pipe or spoon the lime cream on top of the custard and grate the remaining chocolate over the top. Sprinkle with crushed amaretti biscuits.